Samsung will release the software needed at a future date. Samsung read the last e-waste report from Greenpeace too, and likely wasn't too happy about the slamming it got from the organization. Which leads us to the Korean electronics juggernaut's system for upcycling old phones. Specifically, the company rigged a bunch of them together and turned them into a bitcoin mining contraption. 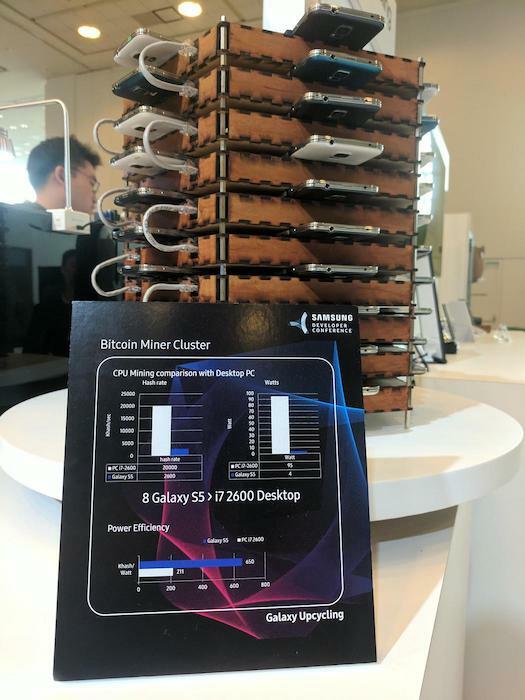 According to Motherboard, Samsung strung 40 Galaxy S5 together to mine recently, and apparently just eight of them wired together can mine in a way that's more power-efficient than a desktop computer. Samsung also repurposed an S3 into a fishtank monitor and a Galaxy tablet into an Ubuntu laptop among other experiments. Motherboard says that Samsung plans to release the software that'll unlock the phones and the software needed to replicate these functions at home soon enough. If you're curious, you can check out Github for more information.